In this article, we will discuss more detailed about Data Transfer in Magento 2. Data is the most important factor in information technology, especially in ecommerce. Regarding to data, you must mention Data transfer, and in Magento 2 we also meet Date Transfer term. As the previous blog “An Explanation For Structure Of Magento 2 System Menu”, we provide general introduction about Data Transfer in Magento 2. In that topic, Data Transfer was mentioned to be included in System Menu in Magento 2. Data Transfer term actually provides tools in order to import and export data. You can organize multiple records in single operation at ease with this import and export data tools. As an admin, you can make use of Data Transfer to import new products, delete items, replace or update data. For instance, if you already have a catalog of products, then you export these data to edit data in a spreadsheet, you can easily import this list back using CSV file into your Magento store. Another outstanding sample is that you can add new product to your Magento site, or update data and advanced prices, or even replace the existing items with those new products. Hence, Data Transfer in Magento 2 ensures to help your adding new product process to become more quickly and conveniently than doing manually. Working with CSV Files: you need to know how to use CSV file for data import. Import: there are 3 other included options: import history, import product images and import guidelines. Export: you need to know about export and export criteria. Product Attribute Reference: this will let you know about list of attributes of product to export. Customer Attribute Reference: you will get details about attributes of customer to export data. 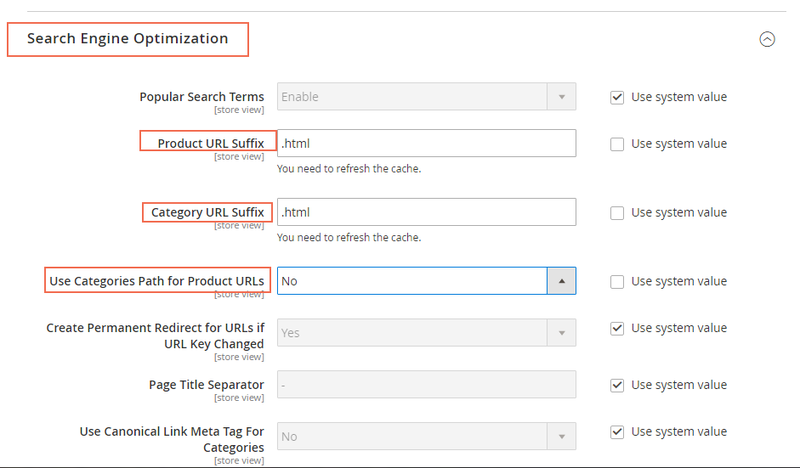 What Is Catalog URLs in Magento 2? The URLs of your online products and categories are extremely important to SEO (Search Engine Optimization). The friendlier your URLs are, the higher possibility that your products will be shown on customers’ search results. Therefore, it is necessary to consider the URLs format and URLs components for your Catalog URLs. URL Key: Describes the product or category, should consist of normal characters with hyphens to separate words. HTML Suffix: The suffix is controlled by the system configuration and can be either include or exclude from the product. Normally, it is set as “html” or “htm”. Step 1: Click Stores in the navigation column on the left. Step 2: Under Setting, tap Configuration. 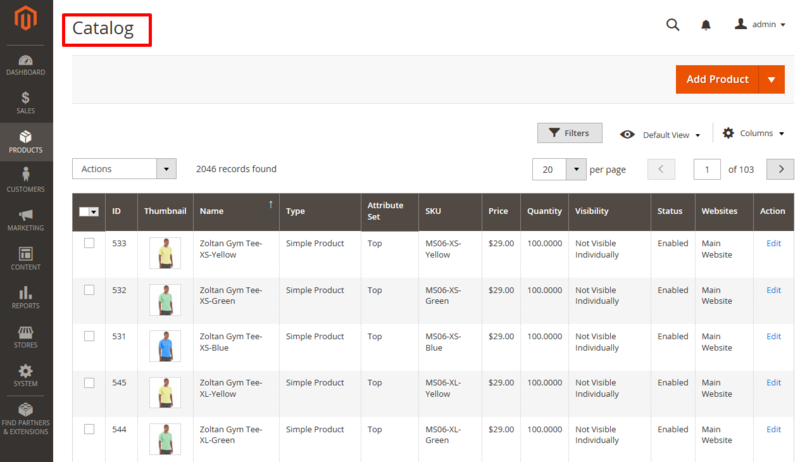 Step 3: Expand the Catalog by clicking on the dropdown sign, then choose Catalog. Product URL Suffix: You can set this as “htm” or “html”. Remember that the period is not needed here because it is filed automatically. Category URL Suffix: Either “htm” or “html” is ok. No period is needed. Use Categories Path for Product URLs: You have three options here: Use system value/ Yes/ or No. Step 5: Click on Save Configuration on the upper-right corner to save your set up. Step 6: When complete, tap the Cache Management link on the notice box and flush Magento cache to finish your work. Author ThắmPosted on June 22, 2017 February 5, 2018 Categories CatalogTags Catalog, magento 2, URLsLeave a comment on What Is Catalog URLs in Magento 2? Talking about an online store in general, and in Magento in specific, we know that there are 2 factors in the site: the frontend and the backend. The frontend is all things what you want to show for customers, whereas, the backend is where you totally control everything about your store, such as products, customers, and so on. In this article, we will introduce about Store Admin in Magento 2 so you can have an overview of this term in the backend of Magento 2. At first, you need to login your account in the backend, and this is your store admin. Actually, Store Admin is understood like a back manager office protected by password. In this office, you enable to configure products, set up promotions, organize and manage order or other admin tasks. Obviously, admin does all the configuration tasks and organize store management. An interesting feature is that when you install Magento, your initial sign-in credentials are set up. In case your password is forgot, there will be a temporary password sent to your email address which is associated with your account. For higher security, you can totally configure a case-sensitive username and password for your store requirement. If you want additional security, you can configure CAPTCHA requirement for admin login. Admin Sign-in: you will learn how to sign in and sign out your Admin account. Your Admin Account: it is initially set up during the installation. Admin Workspace: this factor supplies access to all the tools, data and content you need to organize your store. However, we would not introduce these factors in this blog, and we will reveal them in the next coming article. In short, here is all the details about Store Admin in Magento 2 we want to share with you. If you find it helpful for you, please Like, Share and Subscribe to keep updating for more upcoming blogs!